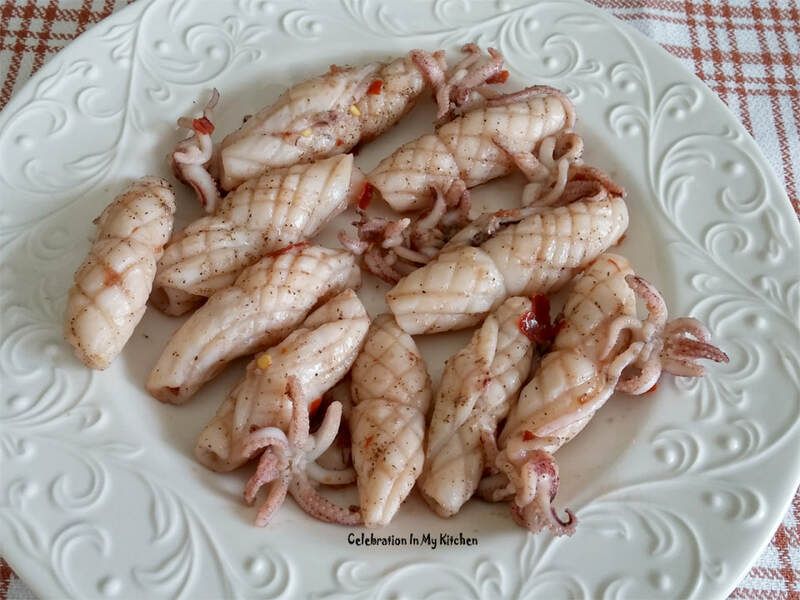 Squid and calamari are two different species, often confused and considered the same. 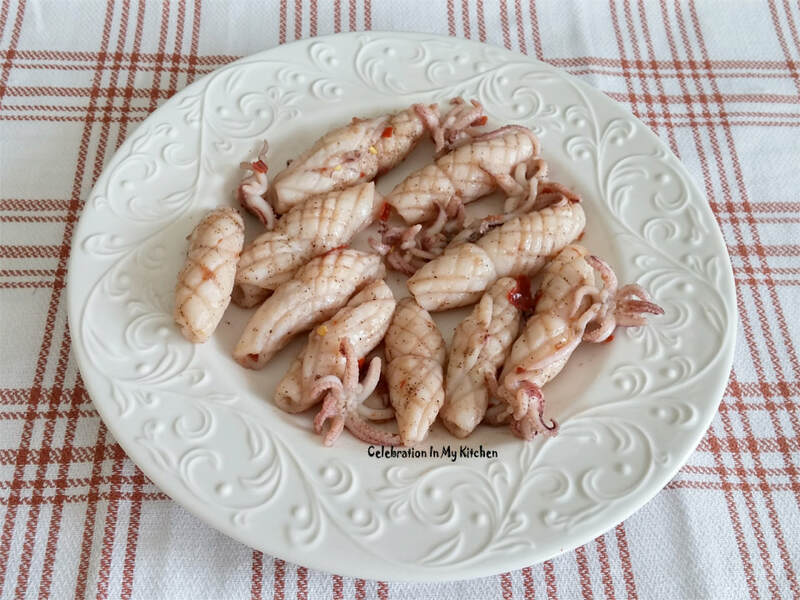 The former has small pointed flaps, larger in size, tougher and cheaper whereas, calamari has long triangular flaps along the length of the body, tender and expensive. This quick squid fry makes a great starter with just two spices. Perfect for any week night to be cooked right away on high heat and relished when tender. Delicious, moist, with a touch of heat and a family favourite!!! A good source of protein, squids are low in fat. Rich in vitamin and mineral content. Ideal for individuals suffering from rheumatoid arthritis who have low selenium levels in their blood. They have an abundance of this mineral. It contains large amounts of phosphorus necessary for stimulating calcium required for the building of bones and teeth. Clean squids separating the body from the tentacles. Discard the ink bag along with the eye, keeping the tentacles. Clean the pocket inside out ensuring to remove the outer surface (skin) of the mantle, internal organs and cartilage. 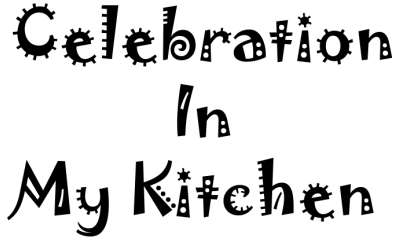 With kitchen shears, cut the body in the centre and open. Place on a cutting board and score the inner side with a knife. Starting from top, going all the way across, create parallel diagonal lines, three-fourth deep into the flesh. Repeat the same in the reverse direction to create a crisscross pattern. Wash well, season with salt and set aside to drain well in a colander for 30 minutes. 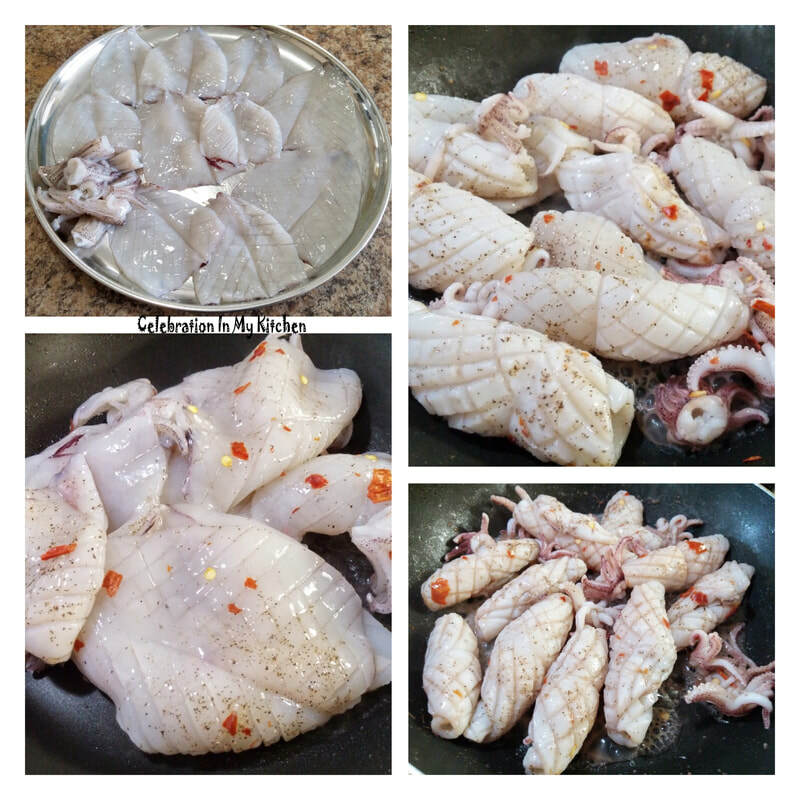 Just before frying, crush a crisp red chilli with your fingers over the squids. Mix with some pepper powder. Heat a skillet on high flame with two tablespoons oil. Add the squids and cook for 3 to 4 minutes. Serve hot drizzled with lemon juice. ​The above spices can be replaced with a couple of tablespoons of recheado masala.